How is all you do so successful? Let me address the second, first. This was such a bizarre question to me the first time it was ever asked, as I didn’t necessarily see myself as successful. For a long time, I measured success as making enough money. The bank account didn’t scream success, nor did it give me the confidence that I was doing anything right at all. But what I began to see over time, and what others were seeing in me before I ever did, was my success at reaching my intended audience and then making an impact on their lives. That still gives me pause to write, simply because I could never EVER do what has been done on my own. God definitely opened doors and placed people in my path, but only after I truly gave it all over to Him. The first question, how do you do it…now that one has always just made me chuckle. I’ve often said, “Walk in my house and you’ll see how I do it all. My house is a wreck! &nbsp;It’s true. I’m not known for my organization skills, nor house-cleaning obsession. Thankfully, I’m married to a gracious man! However, it is something I WANT, and am being honest when I say I’m a work in progress in this area of how to make my home a priority in the midst of so much busy! Being a wife, running my business both online and locally, homeschooling 3 girls over the years (now down to 2 since one graduated), juggling activities and schedules, it’s not easy. And I fail in all areas. A LOT! As I continue to work on where God wants me to be diligent in (yes, I personally believe a well-kept home is one of them) I’ve learned not to condemn myself and to give myself an extra dose of grace in the times my work-load is the heaviest. All this brings me to the following: the biggest difference between me, and, perhaps someone stuck on this side of their dream, is that I don’t let fear hold me back. Oh, it’s there, believe me! Failure is not something I look forward to, nor enjoy on any level. But it’s reality and if you don’t fail, you’re not really trying. I love the following quote written by Winston Churchill. To this I say a resounding YES! One failure after another and still we march on. The alternative is far more painful that the failure, itself: never knowing the difference you could make if you just tried just one more time! I’ve found my calling. I’m constantly honing and working to improve it and reach more with my message, but I don’t wonder what it is. What is yours? What is that quiet calling urging you forward but that you have found a million reasons to put off? If you could think of just one thing you wanted to do before you died, what would your answer be? Some of you may need to think a minute on this. For the rest of you, I barely finished that question before you were internally screaming the answer! You could probably add about 100 more to this list, but remember it’s the “list” that’s holding you back and preventing movement towards the very first step! Speaking of, let’s start working on that very first step. It’s time to pull out your favorite journal because it’s about to become your best friend. Identify what that purpose you were meant to do is, and tell at least 5 people. If you’re struggling with this, ask God for clarity and His vision for your life. Every time you think of an excuse not to move forward, write it down. Then write down 3 reasons to overcome each excuse. Write down 3 ways you are going to start moving closer to that purpose each day for the next 7 days. Give a copy of your 3 ways for 7 days to a friend who will hold you accountable. Go! 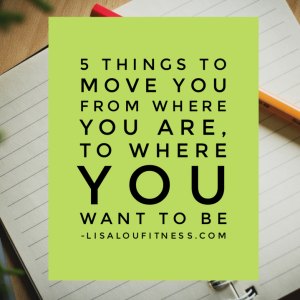 It’s time to start following the road map you’ve just laid out! There are other things and variation of that list but we are going to keep it simple to get you moving. You can do this! You, sweet girl, were made for great things! I’d love to hear your thoughts and your found purpose! Please share your journey with us in the comments below!